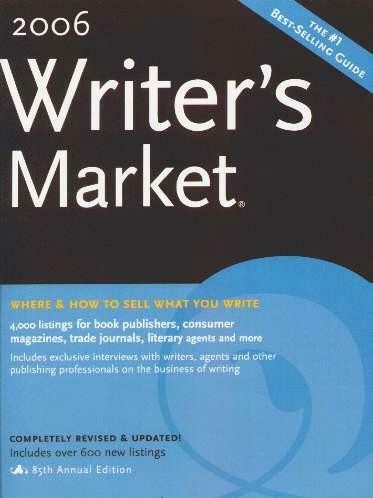 This is the book any serious writer (who wants to get published) should invest in. It's a big fat book that quite possibly holds the answers to all your "how and where can I get published?" questions. Even if all you desire is to be published in a magazine (486 pages of listed consumer magazines), the clues are in this book. If you would like to find an agent, find a suitable potential publisher, or need to know how to write a query letter, what fee you should charge as a proofreader or copywriter, where and to whom you should market your work, what publishers are looking for, their royalty percentages and advances, both fiction and non-fiction, and science-fiction (the list is endless), this is where you'll get all the answers. They also list an incredible amount of contests and awards to try your hand at, and if that's not enough, they've given an extensive index section which is easy to navigate. Whether you can submit your query/manuscript by mail or e-mail, editors and acquisitions contact names, how many manuscripts individual publishers purchase per year - it's got everything you need to know. So, whether you write poetry, screenplays, comic books, horror, children's books, travel, cookbooks, gardening, history, politics, how-to, multi-media, phew!, just about anything, this is the book you need. Conclusion - A must-have for anyone wanting to break into the publishing world.